Full TESS mission data set from Observation Sectors 1 and 2 will be publicly-available for download in early December. Several services will be available to support the community with this early release of data. A summary of those services that will be available at the MAST for TESS data download of the first two TESS Sectors can be found at http://archive.stsci.edu/tess/summary.html. Additionally, the MAST will provide an archive manual that will describe an overview of the TESS data products as well as instructions on how to download them. The manual contains tutorials and python notebooks that walk through how to use the MAST Portal, exo.MAST and Astroquery to retrieve data for scientifically interesting use cases. 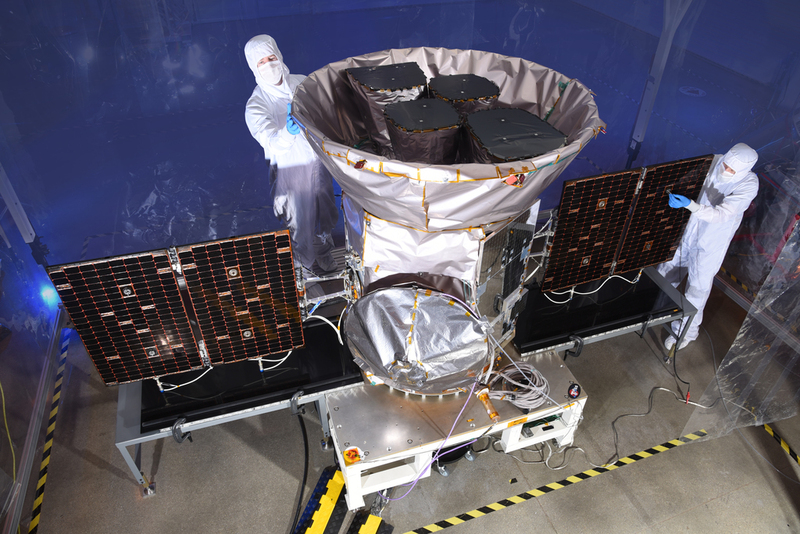 The TESS Science Support Center maintains a list of approved Guest Investigator (GI) programs and their associated targets that are or will be observed at 2-minute cadence in Cycle 1. The observed GI targets lists are also available for individual sectors. The TESS Science Support Center will provide links to additional tools and tutorials that can be used for analysis of TESS 2-minute cadence Target Pixel Files and 30-minute cadence Full Frame Images and also maintains an FAQ page. MIT TESS pages provide information regarding the current schedule of observations. Information on how to submit proposals for Director’s Discretionary Targets to be observed at 2-minute cadence in future sectors can also be found at the MIT site at https://tess.mit.edu/science/ddt/. Questions about the GI program or using TESS data should be sent to tesshelp@bigbang.gsfc.nasa.gov. On February 11-14, STScI will also host a TESS Data Workshop to kickstart community analysis following the public release of the first four sectors. See the Data Workshop page for details and registration information, and contact the Archive Helpdesk for any other questions on this event. The use of API tokens for user authentication will provide both increased security and more efficient coding of cURL and Astroquery scripts. The latest MAST Portal release (v3.8) includes a change to the API authentication mechanism used in downloading exclusive access data via cURL or Astroquery. Instead of using a MyST account username and password, users will now need to provide an API token in order to download protected data programmatically. This change was made to improve the stability of users authorizing with MAST using scripts or third-party applications. It also significantly improves security by eliminating the need to embed usernames and passwords in third-party applications and scripts. This change affects only exclusive access data downloads via cURL or Astroquery, and data access through the MAST Portal will work with your MyST credentials as usual. API tokens are a short blurb that the MAST API will accept to identify a particular user profile. Visit the Auth.MAST website to manage your MAST API tokens and web sessions, using your MyST login. Both Astroquery and the cURL download script will have instructions on how to create and use these tokens. Users should also be sure to get the latest version of Astroquery to ensure compatibility. 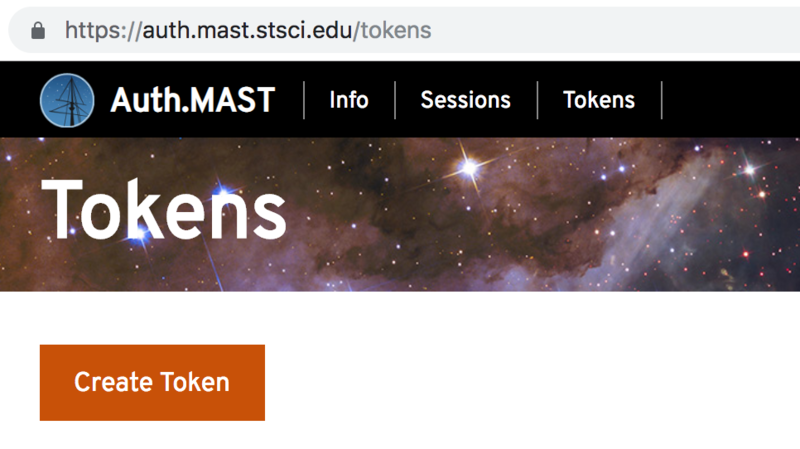 Visit https://auth.mast.stsci.edu to get more details about this new and improved authentication mechanism built on top of your MyST account. Additional questions on the creation and use of API tokens, or other feedback, can be directed to the Archive Helpdesk. Exoplanet targets and associated metadata are now available to search for data across MAST missions. MAST is happy to announce that exoplanet listings and metadata from the NASA Exoplanet Archive are now available in the exo.MAST Portal! Combined with data from exoplanets.org, there are now over 6000 exoplanets and candidates available for query through exo.MAST. This allows users to search by planet for target data across MAST missions, and provides access to exoplanet and stellar properties with references, interactive plots of light curves, and transmission spectra. The Data Coverage plot shows observations, as a function of orbital phase, across missions like Hubble, Kepler/K2, & soon TESS! Seamlessly access data by selecting time windows of interest. For transiting planets, easily find observations taken during transit! The Kepler Lightcurve plot shows stitched light curves folded on the orbital period. It's also folded at twice the period to show the odd/even transits, which can be used to look for false positives. The Transmission Spectra plot shows spectral data from HST. You can directly download the spectra in text format, and a link to the paper abstract from which the data are taken. For additional details on the exo.MAST Portal, see the August announcement article. Further questions on querying exo.MAST and retrieving exoplanet data can be directed to the Archive Helpdesk. New and updated High-Level Science Product collections at MAST include a new survey of nearby core-collapse supernovae, a new outreach image of a young star system, and updates to TESS exoplanet candidates. CCSNE (B. Williams et al. 2018) is a two-filter imaging survey with HST of areas surrounding historic, nearby core-collapse supernovae. The imaging survey provides 9 new pointings (plus 9 parallel fields) with WFC3 and ACS. The collection also provides catalogs of stars in these regions, which are used to infer the initial supernova progenitor masses by fitting stellar evolution models. The STScI Outreach Imaging team has released a set of HST infrared images revealing a planet-forming disk around a young star, HBC 672 (aka EC 82), located in the Serpens Nebula. 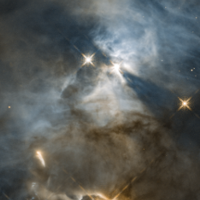 Nicknamed the "Bat Shadow", this feature shows the unseen disk of rock, ice, and dust casting a shadow in the light of the bright young star. Images in FITS format and interactive displays are available at the MAST project page. 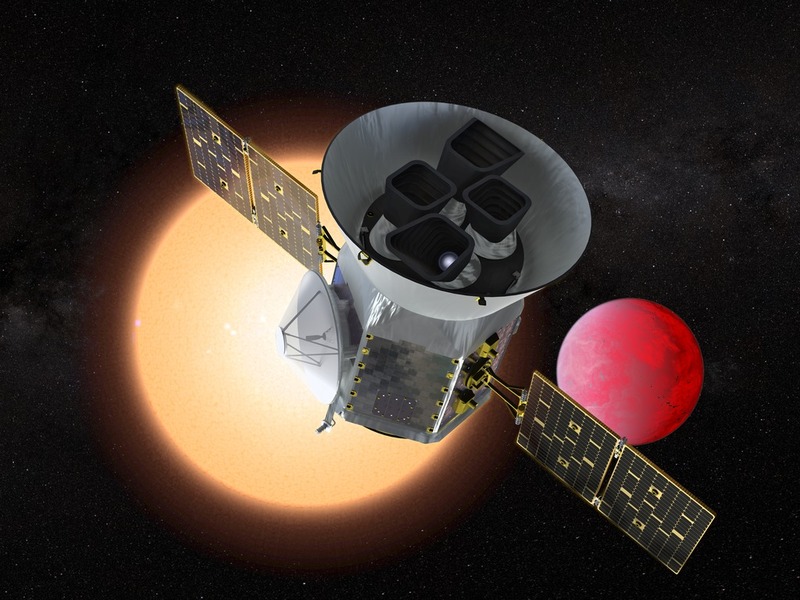 A number of new exoplanet candidates have been added to the TESS Data Alerts collection from TESS Sectors 1 and 2. For the first time, some candidates also include sector-combined data validation files. See the Data Alerts page at MAST for access to the light curve, target pixel files, and data validation reports.